The PAM420 is specifically designed for measurements on electrical power systems. 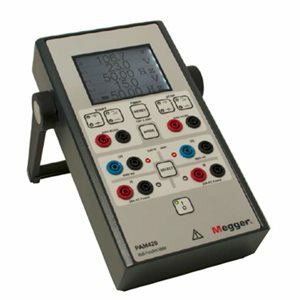 It is capable of displaying phase angle, voltage, current, frequency and timing. The phase angle is calculated from the relationship between two power signals, which can be two currents, two voltages or any combination. Currents up to 25 A and voltages up to 500 V can be applied directly to the instrument. The current input range can be extended by using external current transformers.